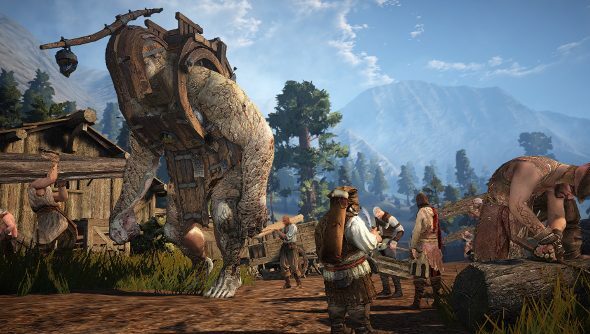 Korean MMO Black Desert Online (the one with the uncanny character creator) has released the first of a now apparent raft of incoming expansions. Itching for a massive, expanding world to fill your free time? First gorge yourself on this list of the best MMOs for PC. This first one, a new region called Mediah, is a 2GB free download with more than a thousand new quests to churn through (which you can see a glimpse of below). Included in there is a massive boss fight against Kzarka, with hundreds of players being able to battle the character at once. There is also a huge 40v40 PvP instance on the Crimson Battlefield, as well as new weapons, armour and echanted equipment for higher levelled players. Korean developers Pearl Abyss outlined more expansions to come on a livestream, including another new ocean-based region allowing exploration above and below the waves. There are also intended to be trading ships and naval warfare in this region, too. Another region to appear in the summer (for Korean players, and considering we in the West haven’t even received the desert region Valencia yet, who knows when for the rest of us) is the elven homeland of Kamaslive with a new playable Dark Elf race. And some time in the future beyond that, Drigan, another new region, will be added to the game featuring more elves, some dwarves and GIANTS. There will be further small content drops too, including an additional tier of mounts, tier 9, including a pegasus, unicorn and HELL HORSE (we hope that’s not just an approximate translation, DualShockers). On the less-horselike end of the mount scale, there’ll also be a baby elephant and some unnanounced trade mounts. On the quality of life side of things, Pearl Abyss said they were looking into a complete rework of the fiddly skill awakening system, and you’ll be able to use in-game voice chat soon instead of relying on having a really loud voice.